So here's my first finish for 2017, but the vast majority of the work for this quilt took place in 2016, the entire year. These are my 2016 project scrap houses, with some holiday houses and just because I like the fabric houses. I sort of arranged my Village into districts, and like a calendar. Valentine's Day houses in row 2, St Patrick's Day house in row 3, April Showers and Easter houses in row 4, May floral houses in row 5, day sail houses in row 6, 4th of July houses in row 7, summer houses in row 8, Halloween houses in row 9, fall houses in row 10, and an entire row of Christmas houses for row 11. I has approximately 1.034 pieces. This was so fun I'm thinking of doing it again this year, except maybe going with spools or basket blocks instead of house blocks. I am so behind on piecing the backs of my quilts that I've instituted a new rule, no new projects started until the backing and the binding for the last project is done. Plus it wouldn't hurt me to have a backing Monday, for the next 3 months, I'm 13 behind! So nothing new until I sew the backing for Village, which I haven't even given any thought to, hopefully I have something on hand to use so I'm not waiting around for a delivery from the mailman. Turned out great! I have been procrastinating on my backings as well but I'm not as a prolific quilter as you are so I'm looking at about 4 or 5. It still feels like more than 13 to me! Lol! I love your quilt. Especially the idea of putting in the celebrations of the year. great idea. I hope you don't mind if I steal that one. Nice, Thelma! I think that it'll be nice to sit with this quilt and look at all the fabric and think back to the quilts that the fabric originally went into and all the memories that went into making that quilt. I like the "breaks" between the houses that you added. If you make a 2017 version, I wonder if your fabric tastes will stay similar or how it will change this year??? Take care. I was just thinking about your houses the other day, hoping to see the end result soon. I wasn't disappointed. It is very cute and a great memory quilt. This is so beautiful. You've taken a little scrappy block design and made it into a stunning neighbourhood. Well done! This turned out great! And I like your idea of documenting 2017 in a similar fashion, albeit with another design. What great memories. 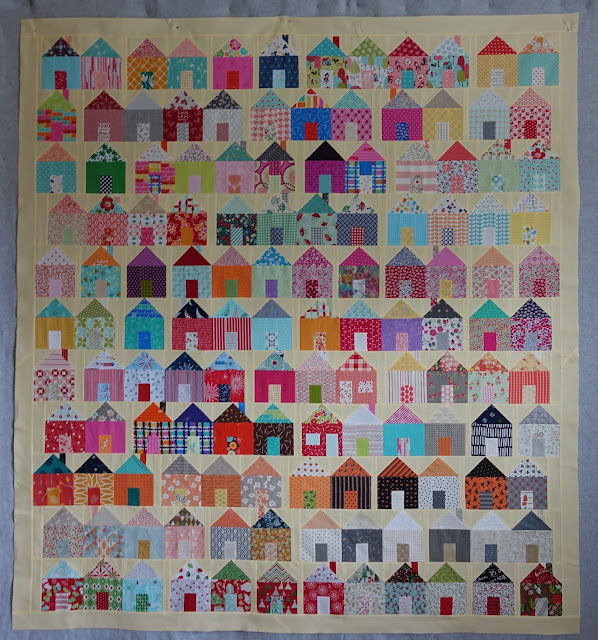 I just signed up for a row by row neighborhood quilt at Quilter Chic. I have had house on the brain for months and this looks like a fun way of trying different house out. I love your house quilt! It is so bright and fun. I bought the pattern mid year last year and think it might be time to start it. So fun! Thanks for the beautiful inspiration. I love your quilt it's so fun and a great way to remember 2016! i wanta live in your neighborhood!!! This turned out very nice, I like the way you offset some of the rows and used spaces between some of the houses. It will be a great souvenir of all of 2016's quilts. I like that idea and think finding another block to do the same for 2017 is inspired. Well done, my friend. Looking forward to your 2018 project! Amazing!! Sew fun to follow you and see your fantastic quilts. Thank you! I loved seeing these houses "being built" over the year on Instagram! I love what you did with the various rows. I purchased this pattern but have not begun, it is on my list for 2017. I have not made nearly as many quilts as you have but I like the idea of counting them. I will have to look back on my blog and count and make note of finishes. I really appreciate the way you did the rows (by holiday). Great finish!